Theirs is a tale of nautical mishap, but time and nature have turned the many wrecks scattered throughout the Gulf and Atlantic into cornucopias of angling abundance. Shrimpers, barges, sailboats, even aircraft litter the sea floor, with each attracting a host of sport fish species that will keep you busy for hours. From inside bays and nearshore shallows within eyesight of the beach, on out to 200-plus feet, wreck action can be fast and furious during summer’s often flat-calm conditions. Specific selections vary with depth and geography, but a handful of dependable lineup of predators provide diverse action with something for all angling preferences. Keep several outfits rigged and ready, watch for targets of opportunity and don’t hesitate to try multiple presentations until you determine what produces on a given day. Once a closely guarded secret, the big cousin of pompano are now a well-known wreck delight that blends schooling aggression with spirited fights and delicious filets. Often seen “finning” at the surface, permit are suckers for a small blue crab or a pass crab fished on a No. 1 light wire hook set through the corner of the shell. Free-lining works best, but if the fish hang deep, add a small split shot or replace the hook with a 1/8-ounce jig head. Much like tarpon, wreck permit can offer enough activity for multiple boats to work a spot, but it only takes on goober to screw it up for everyone. Avoid this by anchoring a respectful distance from anyone who beats you to a spot. Also, never idle across a wreck site looking for fish – especially with other vessels on-site – as this will put the fish down for longer than anyone wants to wait. Drifting is the best way to size up your spot, peak at who’s below and sight cast without spooking these notoriously skittish fish. Despite the traditional explanation of how kingfish migrations bring the fish through Central Gulf Coast waters during spring and fall, there’s usually a fairly dependable batch of summertime action over deep wrecks in about 80-plus feet. Good thing is that the kings hanging around deep water wrecks throughout the year are typically quality fish of 20 pounds or better. Slow trolling livies, just like on the beach, works fine, but downriggers often play a major role when kings dial in on wreck-oriented forage. Free-lining livies while anchored for other wreck species will often score a toothy bonus. Big blue runners, bluefish and vermilion snapper make great summer king baits. You’ll want to beef up your leaders and rigs because big kings and the occasional magnum wahoo hunt the deep water wrecks and they don’t play. There are better spots for mangos, but don’t overlook this option for tossing another dinner species in the box. Fish chunks of frozen sardines or squid on knocker rigs with small circle hooks.If the bite is slow to start, send a live whitebait down to jump start the action. When you hook a snapper, crank like mad or risk losing your catch to marauding cudas or hulking goliath grouper. The consummate opportunists, cudas often patrol the water column above a wreck in search of something to slash with those prominent choppers. They'll make a game of any hookup with long runs and big jumps but these snarling fiends are generally considered a nuisance as they're prone to intercepting live baits dropped or trolled for more desirable species and attacking hooked snapper, kingfish and others on the way up. Nevertheless, if you want some cuda face time, just drop a live blue runner or sardine and hang on. Driven by huge appetites and built for brute strength AJ's are a perennial wreck favorite and their thick, firm filets do very well on the grill or in the smoker. Diamond jigs or heavy leadheads with white or chartreuse curl tails will tempt amberjack, but the direct path to a sore back and a full fish box is live bait. Blue runners, grunts and big pinfish are standard, but netting a load of big whitebaits or greenbacks inshore gives you an irresistible AJ treat. If barracuda are thick, you may have trouble getting livies through the toothy perimeter patrol. Remedy this by deploying livies on downriggers about 50 yards from the wreck and trolling them under the cuda radar and into AJ depths. 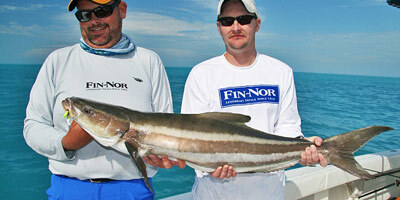 The most consistent way to target wreck cobia is to target other species. Fact is, these flat headed crab crunchers regularly grab live baits deployed for kingfish, intercept jigs dropped for amberjack and wander right up to the boat, apparently sniffing around for something edible. Keep a heavy-action spinning rod rigged with 65-pound braided line, a 40-pound fluorocarbon leader and a 5/0 hook. If the brown bombers show up, pitch a live pinfish or whitebait their way, and it’s game-on. Large plastic eels on half-ounce jigheads also work well for impromptu cobia casting. Whatever your wreck preference, keep an open mind and try multiple baits and rigs to maximize your productivity.